TORONTO, ON--(Marketwired - March 24, 2014) - This Earth Hour, WWF-Canada asks people around the world to stand united for a future where climate change is no longer a threat. 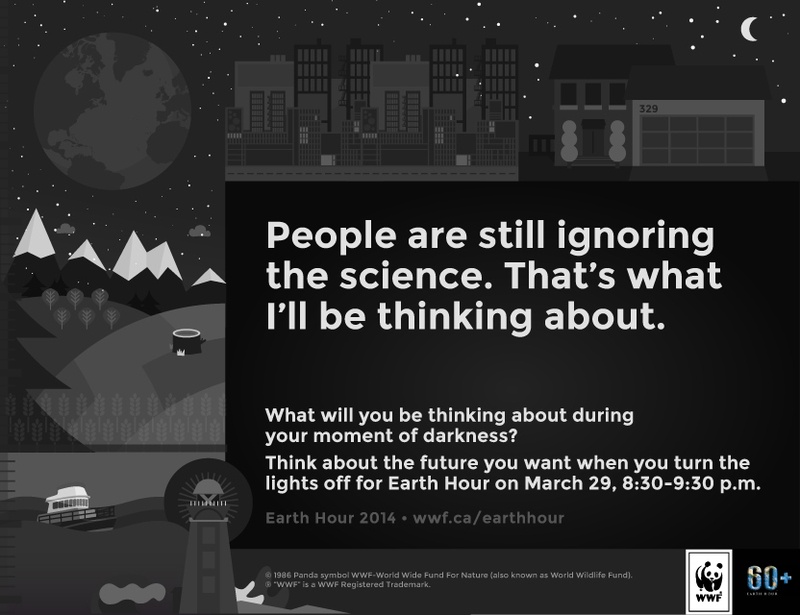 On Saturday, March 29 from 8:30 to 9:30 p.m., WWF urges Canadians to take part in this global movement and switch off their lights for a #momentofdarkness and reflect on the choices all of us can make for a better future. "Canada as a nation can play a big part in the climate change solution. Canadians and Canada have the opportunity to choose a future where climate change is no longer a threat -- to choose a future with clean air, vibrant lands and waters. We can all learn from the leadership of cities like Vancouver and Edmonton, Canada's Earth Hour City Capitals, to create a better future for Canada." Canadian celebrities - including Jason Priestley, William Shatner, Chris Hadfield, Roberta Bondar, Jill Barber, Amy Jo Johnson, Raine Maida and Adam Korson - and citizens have uploaded videos to share what they'll be thinking about during Earth Hour, including their vision for future where climate change is no longer a threat. WWF invites all Canadians to join the conversation by uploading their own videos, tweet about their #momentofdarkness or pledge support towards climate change action at www.wwf.ca/earthhour. Canada has some of the greatest renewable energy potential of any country on Earth. By 2050, WWF believes our nation could-and should-be powered by green energy. WWF has teamed up with the Waterloo Institute of Sustainable Energy to launch a project to map renewable energy potential across the country. The resulting map will it will allow our leaders to make smart energy choices for Canada. Join hundreds of millions of people worldwide and switch off your lights on Saturday, March 29 from 8:30 p.m. to 9:30 p.m. Visit www.wwf.ca/earthhour to join the movement. WWF's Earth Hour is an opportunity for individuals, businesses and communities around the globe to unite in a powerful call to action of hope for a better, healthier planet. In Canada, the Toronto Star is the national sponsor and the Ontario Power Authority is a regional sponsor. As sponsors for WWF's Earth Hour, Toronto Star and Ontario Power Authority will harness their incredible ability to engage employees and reach customers in spreading our message and encouraging individual action.